The "white man's burden" is apparently alive and kicking in the "Tibetan movement". Can an NGO that purports to benefit or represent a particular ethnic group do so with any legitimacy if there are no members of that ethnic group within the organisation? I found myself asking this recently about the UK-based Free Tibet after discovering not only an absence of Tibetans there, but also a lack of accountability to, or regard for, Tibetan voices in exile and their supporters. Even though there are hundreds of Tibetans in the UK, there are no Tibetan staff or volunteers at Free Tibet. In addition, all six permanent staff (bar the Director) have no significant prior connection with Tibetans, or the Tibet movement either. Not only had this worryingly been the case for several years under the current Director (Stephanie Brigden) but there appeared to be little genuine desire to change it. In the past year, three posts were filled by non-Tibetan westerners, none of whom had any prior significant experience or knowledge of Tibet or Tibetans. A new role at Tibet Watch (a sister charity of Free Tibet based in Dharamshala, India that involves working daily with Tibetan speakers) was not awarded to a well-qualified Tibetan candidate. Even a Tibetan man’s offer to volunteer was rejected for petty reasons. Yet Burma Campaign UK, who are based in the same building, have several Burmese members of staff and volunteers who were actively recruited after a change in recruitment policy driven by the BCUK Board and supporters. Free Tibet follow neither the policy of the Dalai Lama nor the democratically-elected Dr Lobsang Sangay as representatives of Tibetans in Tibet, despite the fact they were elected by the majority of Tibetans in exile (many of whom grew up and escaped from occupied Tibet). There is an obvious advantage for Tibetans to be articulating the defence of their occupied homeland, and it is a matter of eternal regret that no charismatic and internationally-respected figure has achieved that role in the last couple of generations (though, personally, I live in hope). Tibetan and Tibetan-led organizations, including community associations, have taken over. There is also a growing change in the make-up of activists, with new arrivals from Tibet not only filling in the ranks and beginning to assume leadership positions in the various groups (and also starting new ones) so that the exile/Tibet (sarjor/ningjor) divide, is fast disappearing. It is also a matter of enormous regret that “Buddhists” in general (and as such) have failed so far to establish a presence in any human rights work to anything like the extent “Christians” have. I put this to the Dalai Lama some many years (decades?) ago and he agreed. As far as I am aware, nothing has changed. Hardly a confidence-inspiring message for Tibetans and their supporters, many of whom are Buddhists. Mr Corry also appears oblivious to the main difference between Christian charity work and that of engaged Buddhism, which does not condone or encourage missionary activities; the emphasis being on personal, inner transformation to benefit others and oneself. To add insult to injury, Mr Corry then equates genuine concerns about the absence of Tibetan voices in the organisation with “whinging about not being given jobs”, despite not having conducted any independent investigation into the matter. Sadly, a similar attitude was displayed on separate occasions by the Director and the Chair of the Executive Committee. How are the funds spent? There is also little accountability to supporters in terms of finance, even though the organisation is completely reliant on supporter funds to survive. As a small but leading UK Tibet agency, it is difficult to justify how half of an annual budget of £500 000 was spent on staff salaries in 2011-12. For a six-staff organisation that’s excessive, particularly when their media and human rights reporting activity is done as well, if not better, by other Tibetan-led and staffed organisations, such as the TCHRD, on a far smaller budget. The public accounts at Companies House reveal little financial information other than headline figures for overall income and expenditure. This means it is almost impossible for a supporter to ascertain exactly where their money is being spent. A detailed breakdown is not provided by Free Tibet on request either. Tibet-led grassroots organisations need support. So, why do so many western media outlets seek out Free Tibet for information and quotes instead of Tibet-led and staffed human rights agencies? Is this yet a further example of the media’s “neo-colonialist” and pro-China bias? The Chinese government propagate orientalist, colonial views of Tibetans, their land, religion and culture. It is undeniable that some of the international impact of the incredibly brave protests and immolations in Tibet this past year was misrepresented by the self-serving, inaccurate comments of overseas foreign media and “experts”, such as Free Tibet. Even though Free Tibet do some excellent work raising awareness about Tibet, we owe it to Tibetans to educate ourselves as to which groups genuinely command the legitimacy and support of Tibetans in exile and those who don’t. There are Tibet-led and staffed grassroots NGOs, such as TCHRD and Students for a Free Tibet, doing first-class work with very little budget. Any suggestion (however well-intended) that Tibetans in exile are incapable of working for the Tibet movement does a great disservice to their incredible intelligence, courage, and resourcefulness. Let’s have a Free Tibet with Tibetans included please. 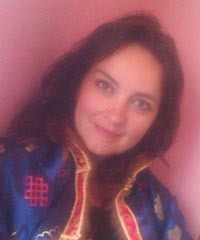 Adele Wilde-Blavatsky is a writer and activist who has spent the last few years commuting between London and India to study Buddhist Philosophy and the Tibetan language. Her work and creativity is driven by her background in Western and Eastern philosophy and the search to reveal the nature of reality and discover meaning in life. With a razor-sharp mind and wit, Adele weaves together ideas and observations on the spiritual, the mundane, gender, sexuality, feminism, human rights, contemporary urban culture, media, and politics in a way which is provocative and enlightening. In 2007, she co-edited a philosophy book Aesthetic Experience with Prof. Richard Shusterman and is currently working on her first collection of poetry for publication ( one of her poems has also been chosen for a poetry anthology in 2012). She currently combines motherhood and working for a charitable organisation in London, UK.